Sea glass can be as large as a quarter or as small as a pea (or smaller), so you’ll have to scan carefully as you walk the beach. 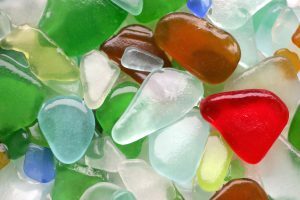 Sea glass can be found in all ranges of colors, but the most common is a medium green hue. The reason green is the most prevalent color is that green glass is the most popular color for beer and soda bottles in mass production. White and green glass is also typical for the same reason. White glass usually dates from the early 20th century, when milk came in thick glass bottles. White sea glass takes on a frosted color when it tumbles in the ocean; it makes beautiful jewelry. While shades of green are the most often found, occasionally a beachcomber will hit the jackpot and find an orange, red, yellow, purple, or turquoise pebble. These colors are highly prized by sea glass collectors. Orange and red sea glass comes from decorative tableware such as colored wine goblets or red ship lights. Yellow is a distinctive color because it would originate with a decorative piece of glass such as a vase, which would not be readily thrown away. Turquoise is another unusual specimen, usually made from seltzer bottles that were popular around the early 1900s. Turquoise and teal sea glass may appear similar, but they have very different origins. Teal sea glass usually comes from vintage ink bottles, or sometimes mineral water or wine bottles. Other noteworthy colors are pink, gray, and black. Gray sea glass gets its coloring from lead oxide — a popular addition to crystal tableware in the 1800s. Black glass dates to around 1700, when beer and liquor bottles were made using iron residue to color the glass. Find a piece of purple glass? It probably started as a glass bottle made before World War I. Some antique bottles contained manganese, which reacts with ultraviolet sunlight to acquire a purple hue. When it comes to scarcity, thickness also counts. If you find a piece of green or white glass that’s more than an inch thick, it likely came from a shipwreck. Clear glass probably came from ship windows, and thick green glass began as a ship’s deck prism, a piece of glass used to reflect light below. Sea glass is small and lightweight, so the best time to hunt for it is at or after a King or Neap tide (super high tides) about an hour before the tide turns to go out, or right after a storm. Early mornings just after sunrise are also prime time for sea glass hunting. Remember — the early bird gets the worm — especially when it comes to beachcombing. As storms increase in frequency and intensity in the fall, you’re more likely to find a piece of sea glass on Sandbridge Beach in late August, September, or October. Choose a bright, sunny day to hunt for sea glass and keep an eye out for that telltale sparkle. As you’re searching, pay particular attention to indentations around heavier debris such as large pieces of driftwood. These watery divots can trap smaller shells and sea glass. On the East Coast, sea glass is a bit hard to find, so it takes some patience. However, the hunt is part of the fun. 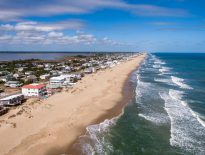 Sandbridge Beach is close to the sites of many ancient shipwrecks, so if you do find a piece of sea glass, you may be holding a part of history. It’s worth the wait. Sea glass is pretty enough to sit in a sunny window at home as a happy reminder of your vacation. However, you can use it in crafts, mosaics, wind chimes, and mobiles. Sea glass jewelry is exceptionally pretty. A single piece can be the focus of a pendant, or two similarly sized pieces make lovely earrings. If you’re handy, you can make your own with supplies from your a craft store. Otherwise, take your treasures to a jewelry artist. Check with your local artist’s co-op or art gallery to find an artisan willing to take commissions. Hunting for sea glass on Sandbridge Beach is fun for the whole family, but it can also be a relaxing solo activity. Go at the right time, walk slowly, and have patience. You may just find your own piece of ancient Sandbridge history.